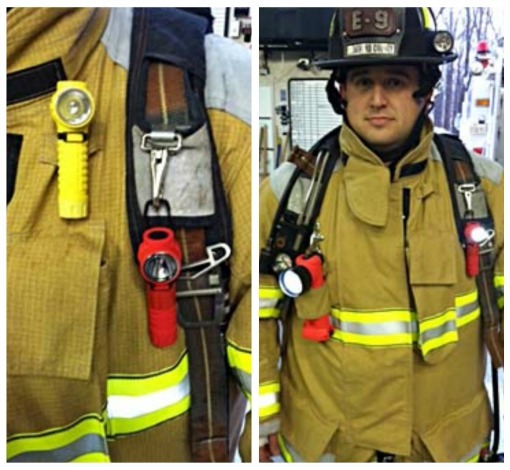 This review of the Polytac 90 light was completed by Engine 9; Lieutenant Bart Lace and (pictured) Technician Justin Doyle. The compact design and excellent illumination offered by the Streamlight Polytac 90 LED make it a respectable alternative to many hand-held flashlights currently on the market. We tried it out and used it for over two weeks in a variety of conditions, but always with the protective gear on. 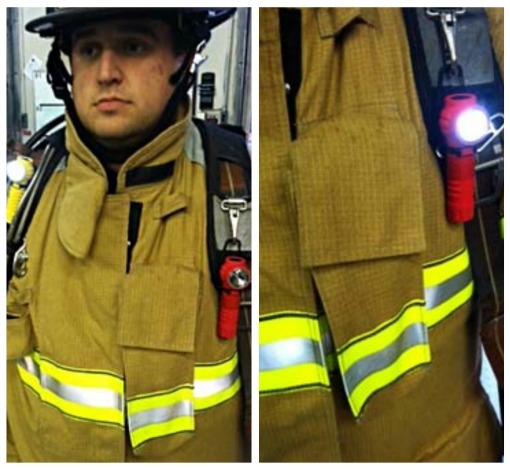 The light can be worn in a variety of places to include a turnout coat, SCBA strap, and reflective clothing. It was always secure and did not present a problem with coming loose or shifting. However, utilizing the lower clip on pliable or softer material (station uniform and some reflective vests) results in the top heavy bulb pointing downwards slightly. This was not an issue, though, for turnout gear, SCBA or when utilizing the top clip. We were very impressed with the intensity and carry of the light beam coming from such a small and lightweight unit. 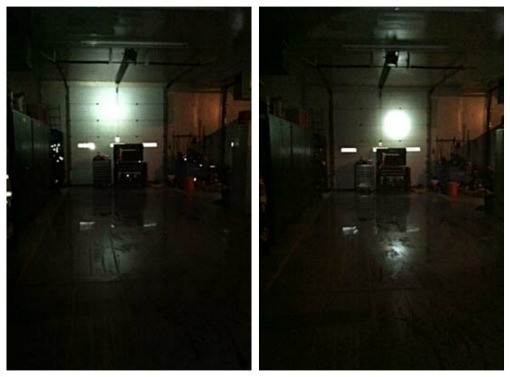 These two photos taken inside the engine bay under near-darkness and with slight lighting show how well the beam travels and illuminates at a distance of about 35 feet. The manufacturer's description says that it weighs 4 oz. and the batteries will last for 30 continuous hours in low-mode. There is also a higher-intensity strength and a flashing setting. We didn't run the batteries down, so we cannot verify the life span. The light comes with the required two lithium batteries. The LED bulb lasts virtully forever, 50,000 hours, so never needs replacing. Overall, we were quite impressed with the light and recommend it. To check out the Streamlight Polytac 90's on our website, click here. Flashlight by Streamlight has been utilized as a part of Crime Scene Investigation Shows on TV. Have you seen those cool, small scale however intense Stinger LED flashlights that the police agents bear a scene?